After a recent surge in business and the purchase of an additional press, Canadian metalforming company Excell Stamping Inc., Kenilworth, Ontario, turned to Colt Automation for a new feed line. Company officials specified the new line for heavy-gauge blanking. It replaces an existing cradle straightener that had served well past its productive life. 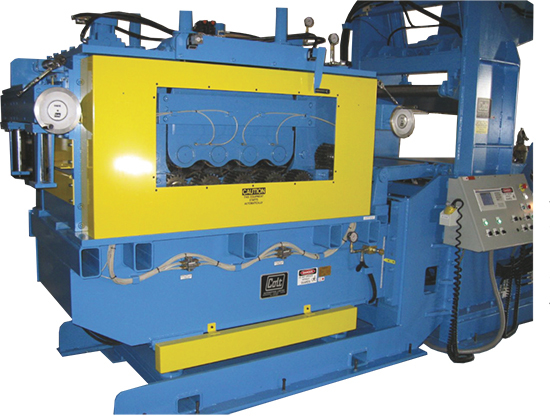 Excell Stamping had begun to experience difficult coil changeovers that required several operators as long as 30 min. to complete. The twist to the story came when Excell asked Colt to provide a cradle straightener unlike most traditional cradles—it wanted to stamp 25,000-lb. coils of material 0.40 in. thick by 24 in. wide from the top of the coil, while employing a nine-roll straightener. And, the width of the machine had to be stretched to accommodate 26-in. material. In the end, Colt designed a self-loading coil-cradle ramp to hold a staged coil—no need to fight with the other parts of the plant for the firm’s sole overhead crane. Identical to a line Colt designed and installed at Excell in 2014, it features hardened side rollers in hydraulically powered 1-in. outer side plates, with a ¾-in. wear plate inside to help avoid material jamming. A hydraulically powered cushion roll absorbs any shock of the loading coil and helps to control the coil as it rolls into place on the 8-in.-dia. cradle rolls. And, an extendable peeler/threader blade easily peels the leading edge of the top payout coil being driven by the motorized holddown roll, and directs the material onto a pivot deflector table and dekinker. Ultimately, the material enters the 6-in.-in.-dia. feed rolls and nine-roll straightener with 6-in.-dia. straightener rolls. Straightening and pinch rolls are of Type 52100 aviation-grade alloy shaft rolls, ground and chromed to RC 60/64. All transitions are machined and then cylindrically ground, polished and chromed along with the roll body. This eliminates shear points and promises to eliminate concerns with downtime due to broken shafts. • Scalable control-hardware architecture, with the ability to add additional axes or remote IO. Controls are based on the Bosch Rexroth Indradrive MLD, with Sercos III communication. • Open software architecture and the ability to use any customer platform—Siemens, Allen Bradley, etc. • Feed speed and acceleration optimization—With the measured press speed and feed angle, by pressing one button the operator can obtain the optimal speed and acceleration so that, with the current feed length, more than 90 percent of the feed angle will be used.